We waited so long for summer this year and now it is ending. I know how school children are feeling as they rush to enjoy their last days as they are fading fast. Well that's how I am feeling now. It seems I have missed so much I wanted to accomplish this summer. I have gone over the evaluation reports and the news is not good. Most of the Granges are continuing their Grange and community work but there has not been a large influx of new members. I can point out the few Granges that had success stories but you have already heard them. In 2008 we had a great year for membership so I know you can do it. Please contact our Grange Growth team for assistance on how to accomplish this. Sister Marge and I have just returned from the Northeast Lecturers conference. What a great time we had. I'm sure you will hear more about it in the Lecturers column, including the fact that the largest group there was from Connecticut. I may be biased but I think the best program was also from there. Sister Marge and I are spending most of our time now helping out at or visiting the many Grange fairs around the state. These are a great culmination of the work the Granges do all year long and the results are wonderful to see. The food is great also, along with the other activities they provide. The sad part is that we can't get to all of them as many are held on the same date. There is always next year. Grange Day at the Big E is in the near future. I have stated that I will give tickets and car passes to any member that wants to attend on Grange Sunday and march with the State Granges in the parade. I was disappointed last year because less than half the people I gave tickets to showed up. This year I will keep a log and if you do not show your chances of getting tickets next year will be slim to none. To improve our appearance in the parade this year the trustees of the NEGB are having a float contest for the parade. The rules will be posted elsewhere in this paper. With summer ending and all the fairs going on that means that our State Session is not far off. 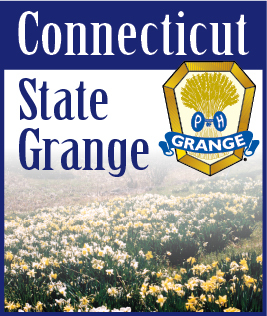 The mailings are going out and your Grange should be receiving them soon. Please fill out the paperwork and make your reservations as soon as possible so there are no problems. There are changes this year but if we all cooperate and do our best this can be a great Session. Get your resolutions in on time remembering that changes in the by-laws need to be in thirty days before the start of the session. This year will feature election of officers so try to have two delegates attending from each Grange. There are also many reports to be done including the Honor Grange reports, so why not do them now. In your spare time, enjoy the rest of the summer. I look forward to seeing you at the Big E and the State Session.